Salford is a trailblazing city for social enterprise – not only was it designated in May 2015 the first ‘Social Enterprise Place’ by Social Enterprise UK (SEUK) in the North West, it remains the only accredited Social Enterprise Place in Greater Manchester. In addition Salford has the most social enterprises in Greater Manchester – 14% of the VCSE sector in Salford identifies as a Social Enterprise compared to 8% across Greater Manchester (State of the Sector report 2017). At Salford CVS we are a member of SEUK as a social enterprise supporter and we provide support to Social Enterprises across Salford from exploring your ideas and advising on legal structures to development of business plans and support with funding applications. 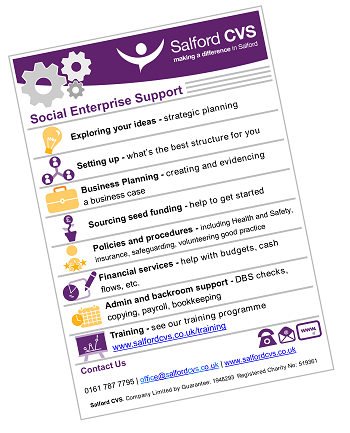 Find out more about the types of support Salford CVS provide for Social Enterprises. We are also part of the Salford Social Enterprise City and throughout the year it organises events from networking to training activities. Find out more here. Salford CVS are a member of SEUK as a social enterprise supporter.